I found this blog by Patricia and Jenna and I loved it! I am a color girl and I know that our world is all about color and how it effects us personally. When choosing the color palette for your wedding connect physically and emotionally with colors that reflect your personalities as a couple. 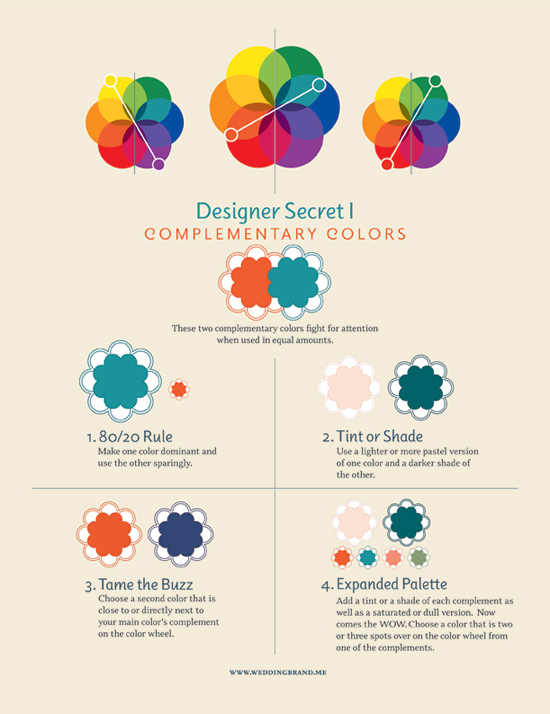 Follow these simple steps to choosing a color palette that will take your wedding from ordinary to extraordinary. 1. Start With Something You Love – Start with a favorite photo, an object, a romantic place. Your entire wedding palette may start with a shared heritage and a bouquet of flowers. You can actually match colors of the leaves and flowers with my Pantone swatch book. (Order on line or visit your local paint store) Another couple got their color inspiration from a photo of the Family that they took while on a romantic vacation. 2. Consider the Season – Factor in any seasonal colors when making your choices (will the church be filled with poinsettias, etc.). Also, make sure that your favorite flowers are available during that time of year. Though anything can be flown in these days, using in-season blooms is much more economical. 3. Look to Your Venue – What is the style of your venue and what colors already exist in the space? What type/color of lighting will you use? 4. Look to Your Fashion – Will you be wearing a colored dress or will you or your partner be wearing an accent color? 5. Look to Your Culture – Is there a color that is culturally significant to you or your family? 6. Look to Your Personality as a Couple – Colors have temperature. Are you warm (like red, yellow, orange) or cool (like blue, green, purple)? Color also has intensity. Are you light and airy (pastel or muted tones), regal (dark and intense) or earthy (neutrals)? 7. Go With Your Tried & True Favorite Color – This one is easy if you already have a signature color! We will help you find an accent. Now that these decisions are made, narrow the field down to one or two main colors. You can choose more if you would like, but we recommend that you use these as accent colors. Colors in their natural order create the simplest color harmony, like the rainbow. Thus, the closer colors are on the color wheel, the more harmonious they are. The further away you get, the more contrast created. Contrast is the drama queen of design, and when done right, can be very striking.